A Virtual Expansion released on 2019-02-14, containing 9 new 2E cards. 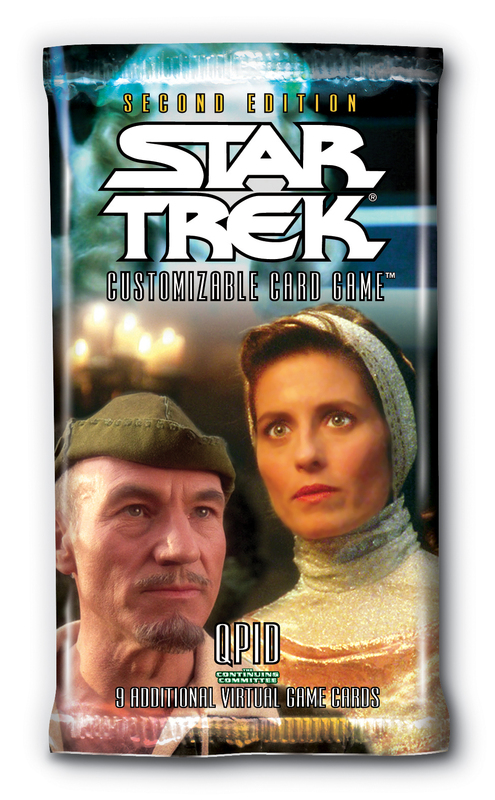 Love is in the air, and The Continuing Committee is expressing its affection with Qpid, a nine (9) card boutique expansion for Star Trek CCG Second Edition. Unrequited love, familial love, fake love, a multi-species love triangle, and even a certain captain of the Enterprise cosplaying in tights - there’s a lot to, well, love about Qpid! A Virtual Expansion released on 2018-12-07, containing 36 new 2E cards. Get to work, Terran scum! 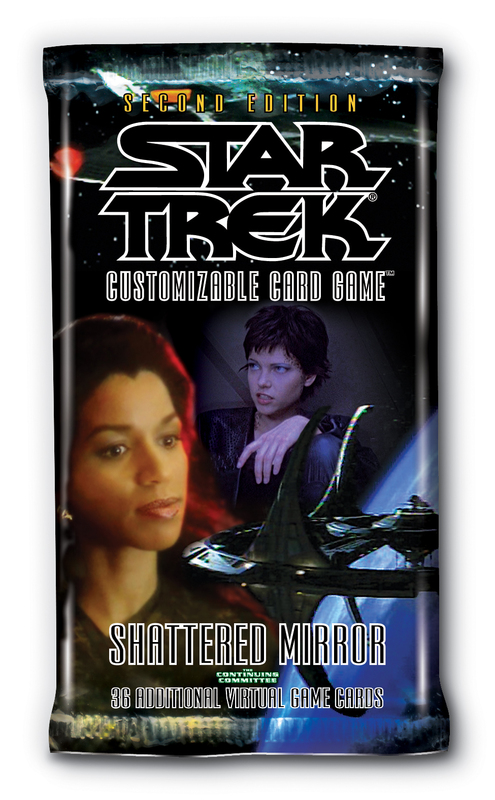 Join your comrades toiling away in Shattered Mirror, the twentythird Star Trek CCG Second Edition virtual expansion from The Continuing Committee. You'll find both the mighty Klingon-Cardassian (and also Bajoran) Alliance and its bedraggled labor force aboard Terok Nor. If working your former oppressors to death isn't your cup of raktajino, maybe you'll like new tools for the prime universe's Klingon Empire. Know your place, follow the rules, and you might even enjoy Shattered Mirror! A Virtual Expansion released on 2018-07-30, containing 9 new 2E cards. 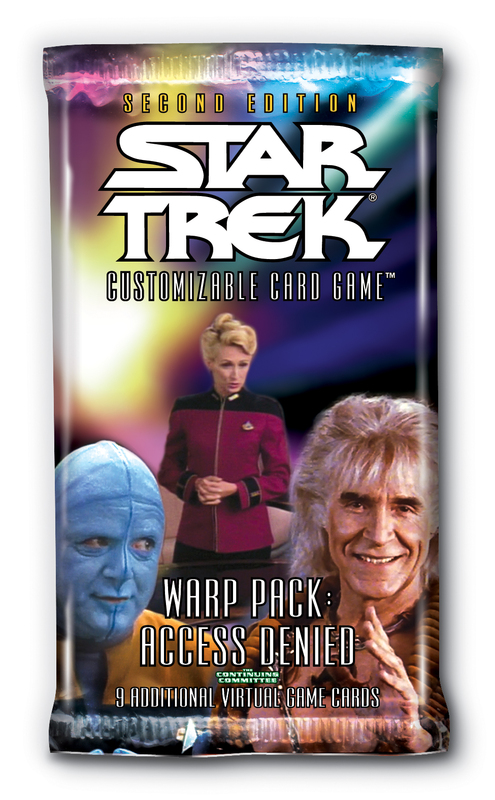 Disrupt your opponent's plans with Warp Pack: Access Denied, a nine (9) card boutique expansion by the Continuing Committee for the Star Trek CCG Second Edition. Whether you use your paranoia to your advantage, unionize your workers to keep the establishment honest, or cozy up to customers to learn their true intent, you'll find the tools you need to keep your opponents on their toes with Access Denied! A Virtual Expansion released on 2018-05-25, containing 18 new 2E cards. 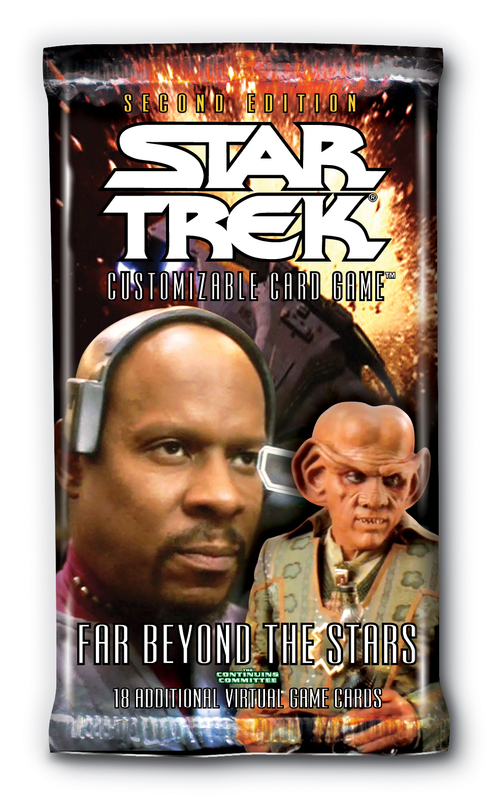 The Continuing Committee invites you to celebrate the twenty-fifth anniversary of Star Trek: Deep Space Nine with Far Beyond the Stars, an eighteen (18) card boutique expansion for Star Trek CCG Second Edition. 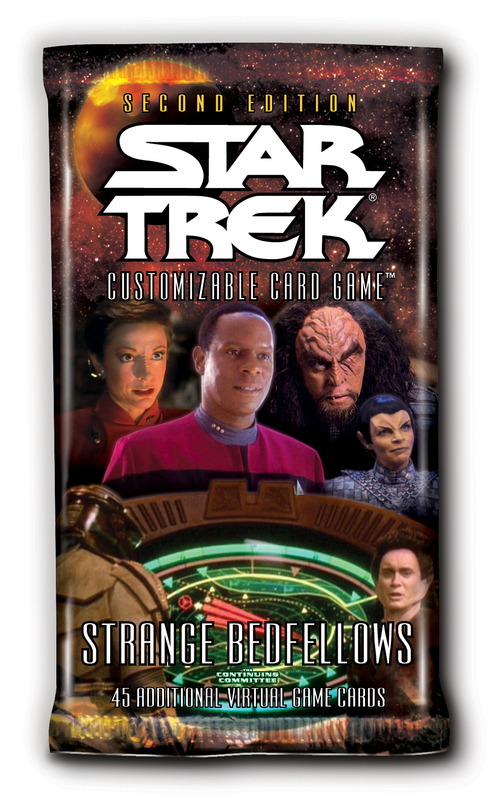 Recreate memorable scenes from Deep Space Nine, discover new versions of beloved characters and ships, and return to a cherished place Far Beyond the Stars! A Virtual Expansion released on 2018-03-23, containing 27 new 2E cards. A Virtual Expansion released on 2017-10-31, containing 9 new 2E cards. 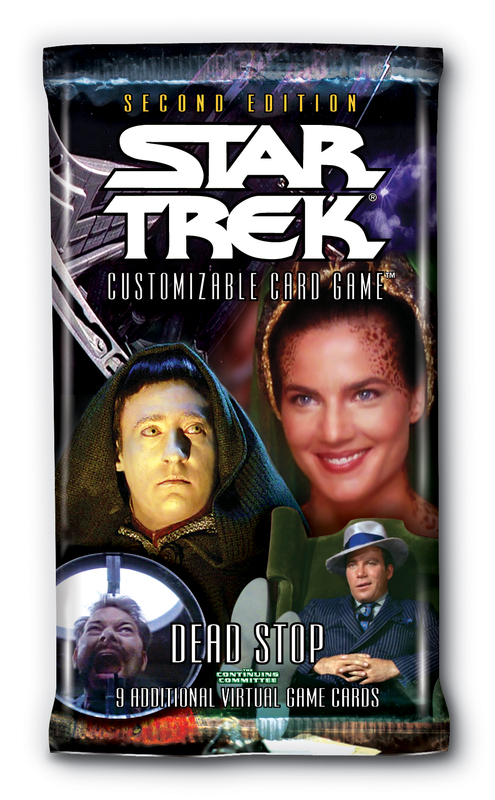 Find out just how spooky the galaxy can be with Dead Stop, a nine (9) card boutique expansion for Star Trek CCG Second Edition from The Continuing Committee. Monsters and other lethal dangers lurk in the shadows, a creepy space station beckons, and some of your favorite heroes don costumes ready to join you for some treats. These cards will bring you to a Dead Stop! A Virtual Expansion released on 2017-10-20, containing 27 new 2E cards. Are you struggling to upgrade your decks to meet the latest galactic crisis? No problem. Here's The Nth Degree, the twenty-first Second Edition virtual expansion built by The Continuing Committee. Explore both madness and genius with a slew of powerful new crew members and equipment along with incentives to diversify your deck. Go beyond what you believed possible and take your game to The Nth Degree! A Virtual Expansion released on 2017-06-02, containing 45 new 2E cards. 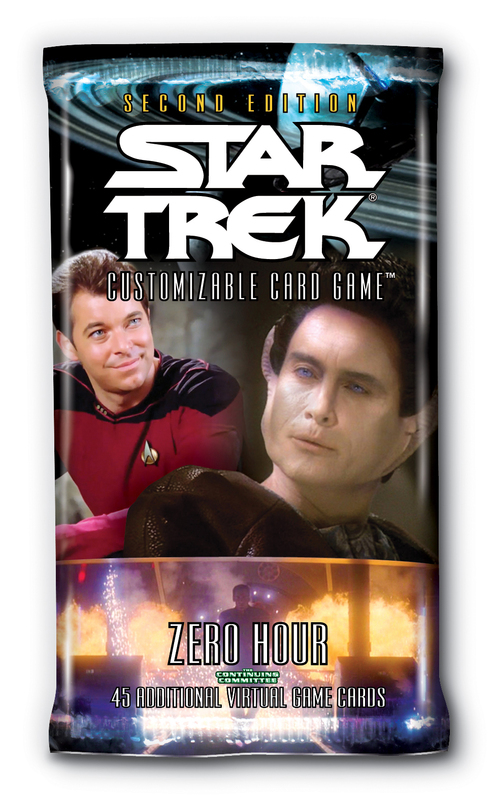 It's time to explode into action with Zero Hour, the Continuing Committee's twentieth Second Edition virtual expansion! The culmination of the past few years in Second Edition design, you'll find new tools for the variety of archetypes that Phase II showcased. Keep your shields up and phasers charged, because these affiliations will be combat ready when the clock ticks down and Zero Hour strikes! A Virtual Expansion released on 2016-09-30, containing 18 new 2E cards. 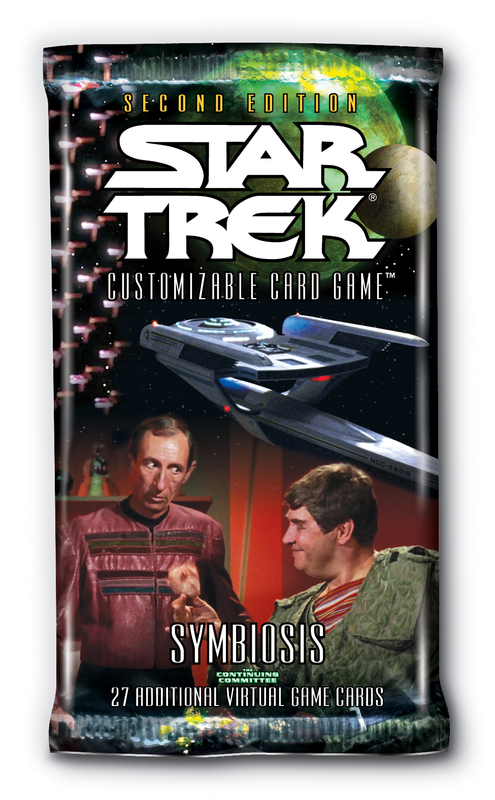 The fate of the final frontier hangs in the balance as villains scheme against heroic efforts in Star Trek 50: Second Edition, the third virtual Star Trek CCG Second Edition boutique supplement from the Continuing Committee. This eighteen (18) card virtual set pits fifty years of heroes against iconic foes revealing their master plans for galactic supremacy. Relive some of the franchise's greatest conflicts celebrating valor and vengeance in Star Trek 50: Second Edition. A Virtual Expansion released on 2016-09-09, containing 45 new 2E cards. 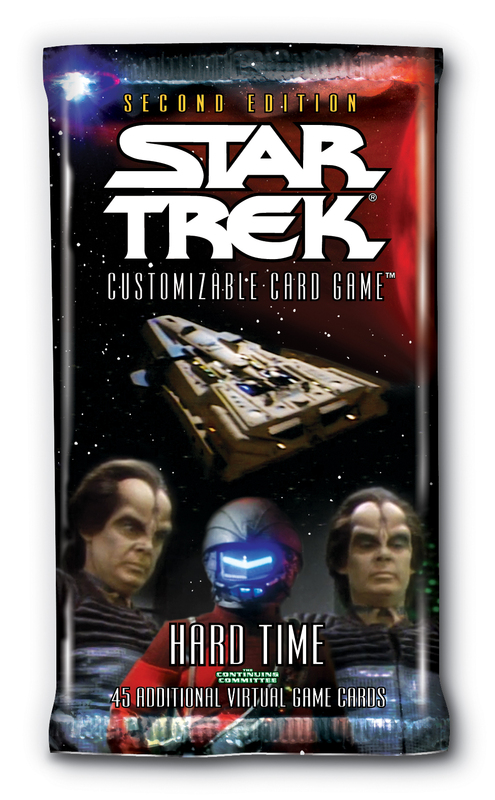 The Continuing Committee has no information about Hard Time, the nineteenth Second Edition Virtual Expansion. It certainly isn’t full of underhanded counterparts to classic dilemmas of the past, nor a contingent of smugglers and contraband ready for mischief, nor a cadre of villains eager to reshape the quadrant. But if you see any such wrongdoing, report to the nearest constable to make sure those criminals serve some Hard Time. A Virtual Expansion released on 2016-05-27, containing 21 new 2E cards. Welcome back to the world of Second Edition draft play with Infinite Diversity: Remastered! This updated version of the original draft product brings you a revised card pool, cleaner and simpler rules, and a wider variety of draft choices! Plus, enjoy new alternate image versions of three (3) cards! Enjoy everything draft and Second Edition have to offer with Infinite Diversity: Remastered. A Virtual Expansion released on 2016-04-22, containing 45 new 2E cards. Make your mark upon the galaxy as you explore A Time To Stand, the eighteenth Second Edition Virtual Expansion from the Continuing Committee! The Maquis are determined to the hold the line in the Demilitarized Zone, while Starfleet stakes its claim in the galactic community. Allies and enemies will discover new territory among a host of new missions, eagerly seeking A Time To Stand! A Virtual Expansion released on 2015-11-13, containing 45 new 2E cards. Prepare your fleet to encounter Face of the Enemy, the Continuing Committee's seventeenth Second Edition Virtual Expansion! After decades of silence, the Romulan Star Empire reemerges, ready to test themselves against the flagship of the Federation. Along with a new armada of options for ships of all classes, you will be compelled to gaze upon the Face of the Enemy! A Virtual Expansion released on 2015-07-03, containing 42 new 2E cards. It's time to go deep with Lower Decks, the sixteenth Second Edition Virtual Expansion from The Continuing Committee. Delve into the bowels of Voyager to reform a team of misfit officers, discover new abilities within the endless ranks of the Borg Hive, or profit from the most electrifying entertainment in the Delta Quadrant: Tsunkatse! All hands, report to Lower Decks! A Virtual Expansion released on 2015-04-10, containing 45 new 2E cards. Galactic exploration, primeval mysteries, and even armed conflict make for Strange Bedfellows, the fifteenth Second Edition Virtual Expansion from The Continuing Committee. The Founders have hidden themselves away at a new homeworld, and while the Dominion continues to expand through trade and conquest, Deep Space 9 invites the Romulans and Klingons as allies. An ancient puzzle also promotes new forms of cooperation among affiliations; who will you count among your Strange Bedfellows? A Virtual Expansion released on 2014-11-28, containing 18 new 2E cards. 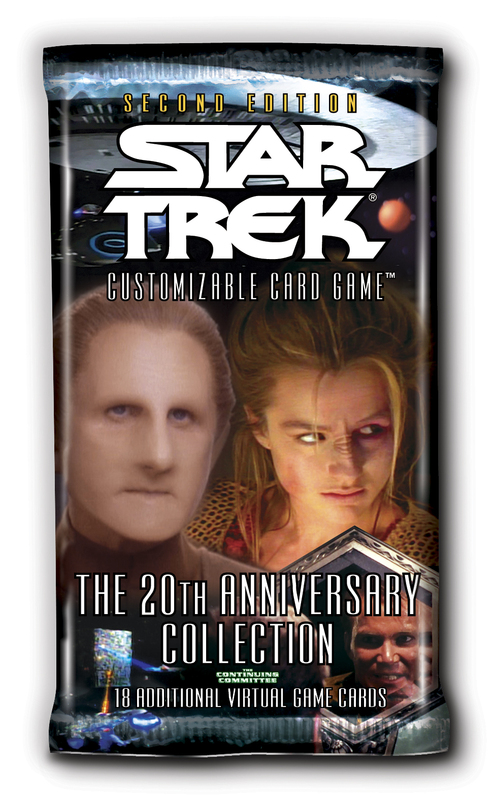 Relive twenty years of the Star Trek Customizable Card Game with The 20th Anniversary Collection, a special eighteen (18) card celebration of Second Edition’s history. 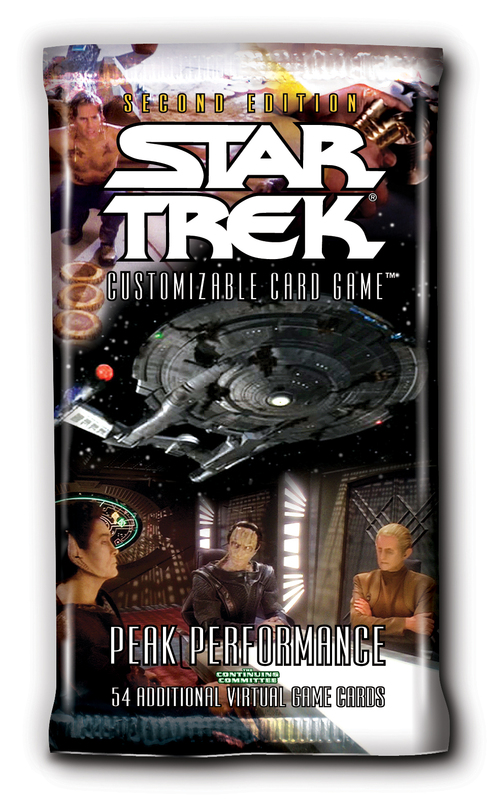 Featuring cards inspired by each Decipher-era product and from the most recent Continuing Committee expansions, everyone will find a way to relive old memories and build new ones as the Star Trek Customizable Card Games begin their third decade! A Virtual Expansion released on 2014-09-12, containing 45 new 2E cards. Prepare to face some of the galaxy’s most menacing forces in Balance of Terror, the fourteenth Second Edition Virtual Expansion from The Continuing Committee. The threats range from body-snatching conspirators, to invaders who have reclaimed Terok Nor, to backstabbing Starfleet officers ready to exploit your panic. Meanwhile, Species 8472 – as fearful of you as you are of them – make their 2E debut with a stunning new victory condition. Who can you trust, and what paranoid tactics will you adopt, as you experience Balance of Terror? A Virtual Expansion released on 2014-03-14, containing 54 new 2E cards. Two of the game’s oldest affiliations and rivals are the focus of Return to Grace, the thirteenth Second Edition Virtual Expansion from The Continuing Committee. The Prophets have smiled on Bajor with their Orbs and a brandnew headquarters mission, while the Cardassians gain new tools to pilfer any resources they can to ascend once more, and a fresh dilemma strategy emerges as well. You’ll have to rethink what you discard; nothing goes to waste as these two bitter enemies Return to Grace. A Virtual Expansion released on 2013-08-16, containing 54 new 2E cards. Ambition, thievery, and tough choices are all part of Unnatural Selection, the twelfth standard Second Edition Virtual Expansion from The Continuing Committee. These fifty-four (54) virtual cards enable you to forge an epic destiny for Khan and his followers with a new win condition, destroy your opponent's morale by plundering their deck with new Thief strategies, and spice up your local tournament scene with dilemmas designed to police the top decks from the past year. Live fast, prosper, and take what you want by boldly making an Unnatural Selection. A Virtual Expansion released on 2013-02-22, containing 54 new 2E cards. Even if you hate temporal mechanics, you're sure to value every moment of Matter of Time, the eleventh standard Second Edition Virtual Expansion from The Continuing Committee. This fifty-four (54) card virtual expansion transports you back to Second Edition's past with enhancements for long-forgotten cards, alters the present with game-changing cards to punish abusive strategies, and protects the future of the timeline custodians tasked with ensuring its survival. Make your deck one for the history books - it's only a Matter of Time. A Virtual Expansion released on 2012-09-21, containing 18 new 2E cards. Celebrate a quarter-century of the adventures of Captain Picard and the crew of the NCC-1701-D with Tapestry: The Next Generation 25th Anniversary Collection. 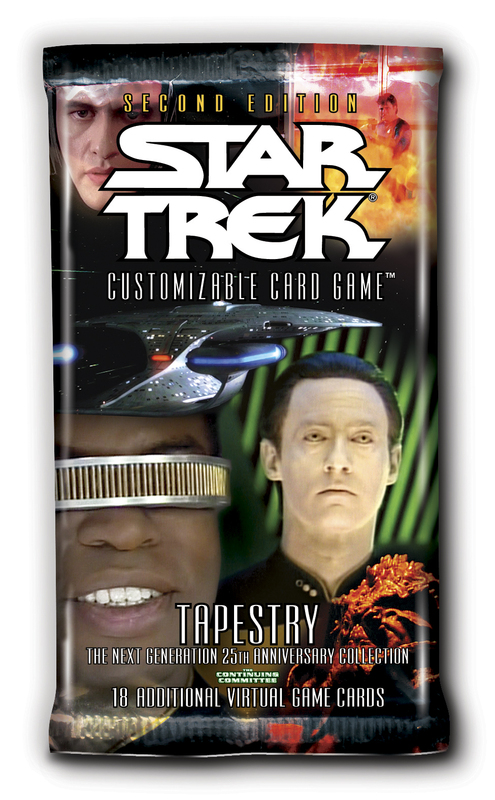 Featuring new versions of many of the crew of the Enterprise and cards from iconic moments in the show’s history, Tapestry reminds us of the fun and exciting adventures from The Next Generation and brings them to your decks! A Virtual Expansion released on 2012-06-29, containing 54 new 2E cards. Evolution, heritage, and cultural diversity all contribute to Lineage, the tenth standard Second Edition Virtual Expansion from The Continuing Committee. This fifty-four (54) card virtual expansion offers new significance on personnel species, aid for some struggling affiliations, a host of species-related missions, and a new, improbable team. Dare to explore the advantages that an unlikely menagerie of life-forms can provide, each with their own distinct Lineage. A Virtual Expansion released on 2011-12-23, containing 54 new 2E cards. "I'm willing to help, but I can't do it alone." Avarice, meta-consciousness, and the universal desire for a permanent home come together in Unity, the ninth standard Second Edition Virtual Expansion from The Continuing Committee. This fifty-four (54) card virtual expansion features support for four brand-new teams as well as two new keywords. Also, several new personnel make their debut to support and flesh out existing teams. Make no mistake, there are plenty of opportunities for everyone to beg, borrow, or steal from Unity. A Virtual Expansion released on 2011-08-05, containing 54 new 2E cards. Starships are the heart of every crew and the center of every adventure, and they finally take center stage in Tacking Into the Wind, the eighth standard Second Edition Virtual Expansion from The Continuing Committee. This fifty-four (54) card virtual expansion contains a ship for almost every affiliation and sub-affiliation, including the debut of the long awaited U.S.S. Enterprise-A and U.S.S. Enterprise-B. In addition, this expansion features ships or ship-related story on nearly every card and for nearly every deck imaginable. It'll be time to revisit old and forgotten deck types with fresh eyes (and fresh engines) when Tacking Into the Wind sets sail. A Virtual Expansion released on 2011-02-04, containing 54 new 2E cards. Take your decks to the extreme with the risks and rewards found in Extreme Measures, the eight Second Edition Virtual Expansion from The Continuing Committee. 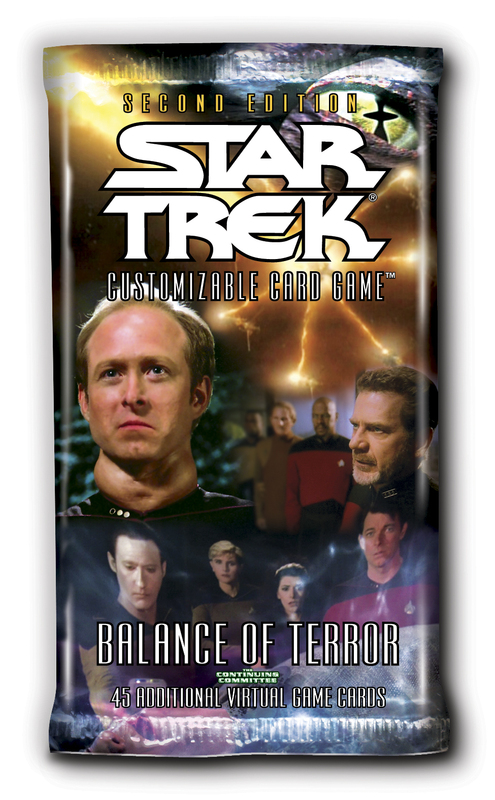 The fifty-four (54) virtual cards contained within provide a new team for the Bajorans featuring the men and women of the Resistance. New tools for Deep Space Nine, Ferengi, and many more affiliations will help players across the world to find new ways to score points and even more ways to lose them in this expansion spiritually reminiscent of Necessary Evil. How far will you go when exploring the ins and outs of Extreme Measures? A Virtual Expansion released on 2010-09-03, containing 54 new 2E cards. Optimize and enhance your favorite decks with Peak Performance, the seventh Second Edition Virtual Expansion from The Continuing Committee. This fifty-four (54) card virtual expansion brings new weapons to many struggling affiliations and provides new weapons to combat the most powerful decks. Occupy and rule Terok Nor with an iron fist, observe new Rituals with the protocol-obsessed Kreetassans, and journey into the Delphic Expanse to save Earth with a desperate Starfleet. What will it take for you to reach maximum efficiency with the cards in Peak Performance? A Virtual Expansion released on 2010-04-23, containing 20 new 2E cards. Bring new options and new opportunities to your game with Infinite Diversity, the new Second Edition draft kit from The Continuing Committee! Featuring new dilemmas, new events and a cycle of personnel new to Second Edition, Infinite Diversity is designed to enhance the game in multiple different dimensions. 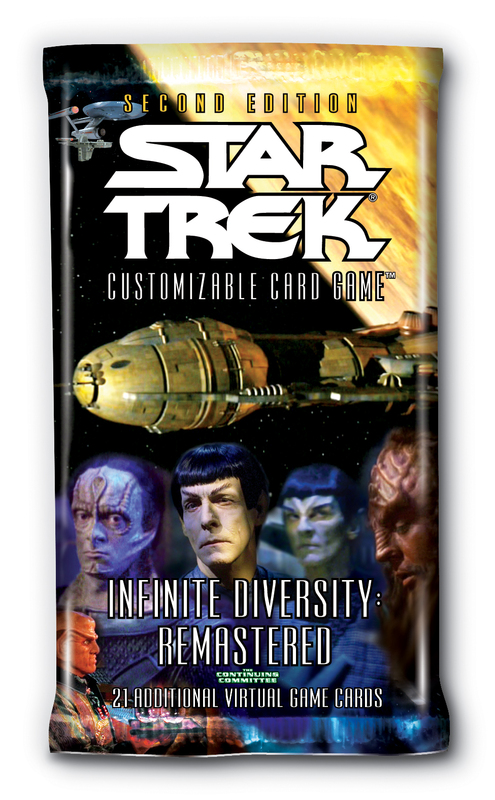 Now, you can truly explore the meaning of the ancient Vulcan proverb of Infinite Diversity in Infinite Combination! A Virtual Expansion released on 2009-12-25, containing 45 new 2E cards. It's all about teamwork, and it's time to declare your Allegiance with the sixth Virtual Expansion from The Continuing Committee. Will you sacrifice your morality with the crew of the Equinox? Raid 22nd century starships with the Ferengi pirates? Protect your ancestors with the crew of E-Squared? Boldly go with the original crew from The Motion Picture? Or defend the station with the vastly outnumbered crew of Deep Space 9? Which team will you choose? Where does your Allegiance lie? A Virtual Expansion released on 2009-11-06, containing 15 new 2E cards. Old cards are given new life and new cards are given unique opportunities with Legacy, part of the 15th Anniversary Collection. Featuring cards created by past and present STCCG designers, Legacy honors and celebrates the game while infusing it with new life. A Virtual Expansion released on 2009-08-14, containing 45 new 2E cards. Take a walk on the wild side with the arrival of This Side of Paradise, the latest virtual expansion from The Continuing Committee. Forty-five cards featuring the most beautiful ladies of Star Trek herald not only new opportunities, but dangerous threats for each and every player's best decks. Add some beauty and some danger with each new card, only with This Side of Paradise. A Virtual Expansion released on 2009-01-23, containing 90 new 2E cards. "The riskier the road, the greater the profit," say the Ferengi. Never have the risks or the rewards been more intense than with Raise the Stakes, the third virtual expansion from The Continuing Committee. Higher costs bring greater benefits: from mid-game events with big benefits to massive personnel that can play for free, all 90 cards in the double sized Raise the Stakes take the game to a whole new level. Enhance your old decks and inspire new decks with every single card - the stakes have been raised, indeed. A Virtual Expansion released on 2008-08-15, containing 45 new 2E cards. Expect the unexpected with Favor the Bold, the second 45-card virtual expansion from The Continuing Committee. New versions of old favorites join newcomers to Second Edition with a single purpose - to shake up the game forever. With twenty new dilemmas, nearly every other card dedicated to affecting dilemmas - not to mention, the first card ever designed by the community - today's game will never be the same. A Virtual Expansion released on 2008-05-09, containing 45 new 2E cards. From what we left behind, venture forth into The Undiscovered Country in this new, 45-card virtual expansion. 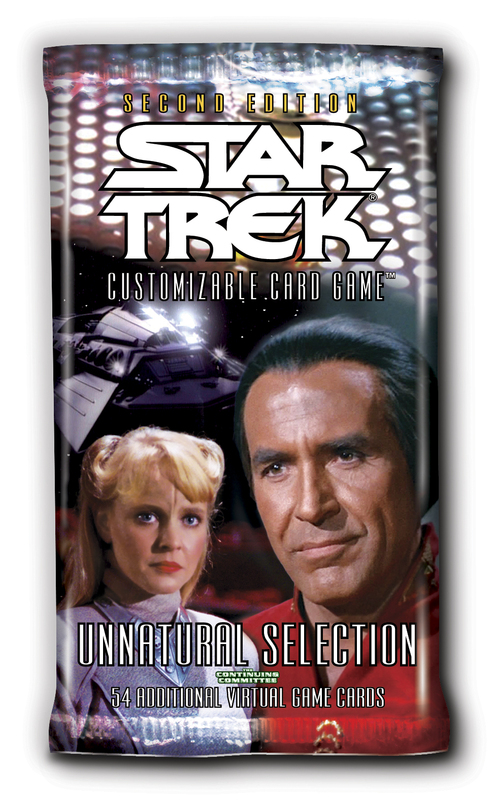 Featuring more than a dozen cards from Star Trek VI and cards for each affiliation and sub-affiliation, this groundbreaking expansion will open up new game play and revitalize old cards. 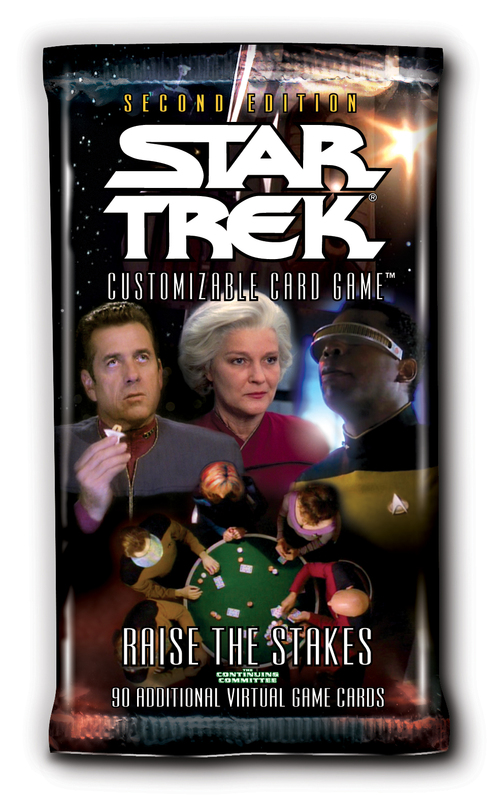 A Virtual Expansion released on 2008-05-01, containing 252 new 2E cards. This list includes all of the alternate image or other promo cards produced in virtual form by The Continuing Committee. Virtual Promo cards 0 VP 33 through 0 VP 47 are part of The 15th Anniversary Collection, known as Things Past. Old cards are given new life and new cards are given unique opportunities with Legacy, part of the 15th Anniversary Collection. Featuring cards created by past and present STCCG designers, Legacy honors and celebrates the game while infusing it with new life. Download these Virtual Expansion and Promo Cards! A Physical Expansion released on 2007-12-14, containing 122 new 2E cards. What You Leave Behind. 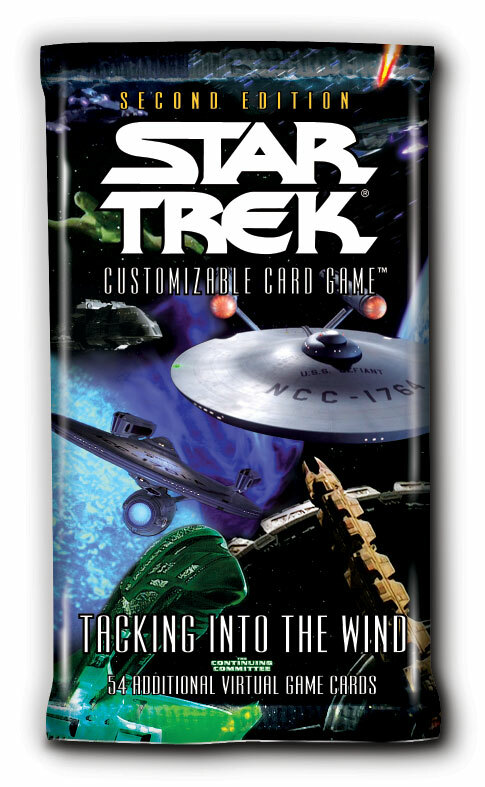 The newest expansion for the Star Trek CCG Second Edition adds new strategies for all affiliations, and brings to the forefront some of the favorite moments of the Star Trek universe. The 122-card expansion includes an 18-card subset of rare cards that appear in both regular and diffraction foil versions. A Physical Expansion released on 2007-06-25, containing 122 new 2E cards. 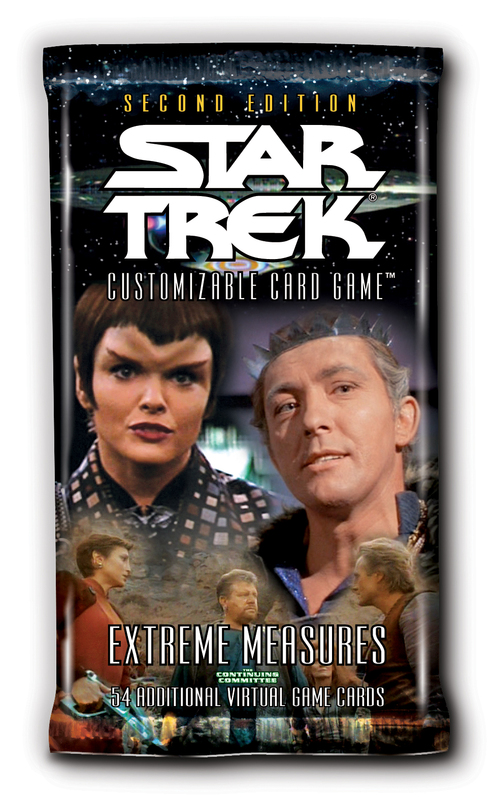 A Physical Expansion released on 2007-03-13, containing 122 new 2E cards. Kirk, Spock, and McCoy? What else could one ask for? Incredible gameplay and gorgeous images as well? These Are The Voyages take Star Trek Second Edition to new levels. A Physical Expansion released on 2006-11-13, containing 27 new 2E cards. What is Genesis? 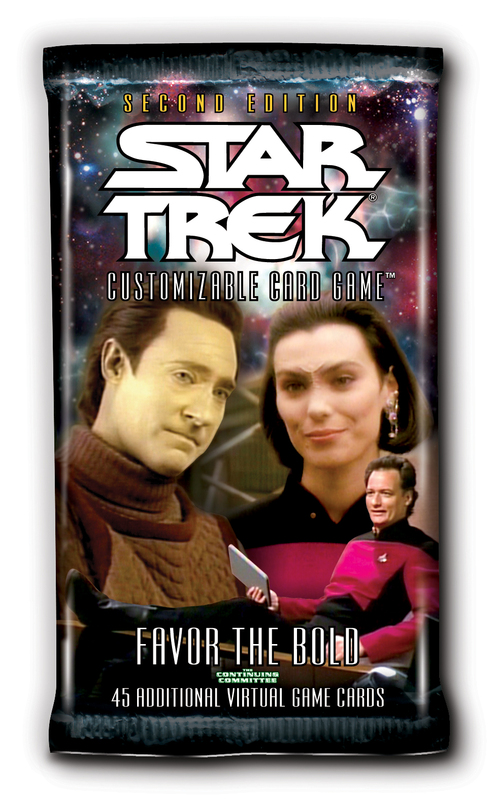 Genesis is a 27 foil card collection to enhance your Star Trek Collection. 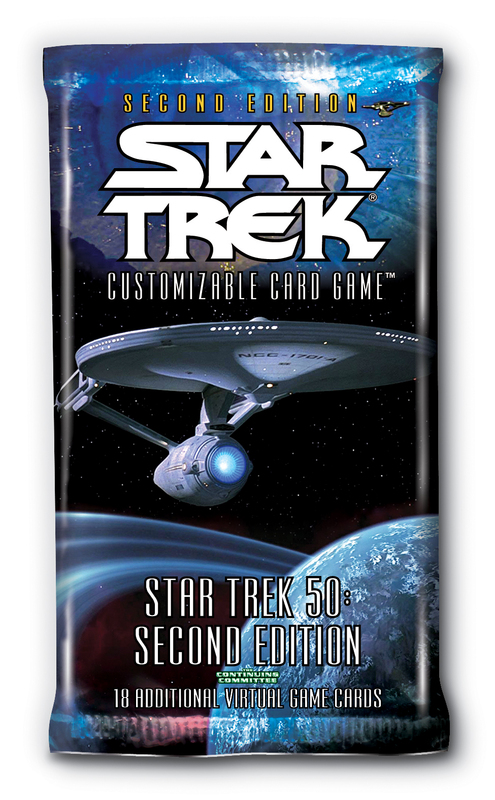 All 27 of these Second Edition cards is compatible with the first edition Star Trek CCG game. A Physical Expansion released on 2006-10-27, containing 120 new 2E cards. 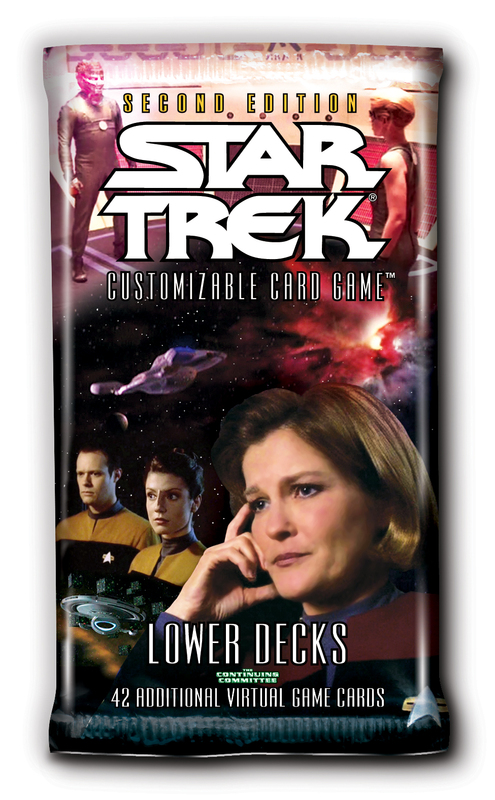 Captain's Log brings to life your favorite Voyager characters like Captain Janeway, Chakotay, Tuvok, and even the new U.S.S. Voyager. To compliment this, all the other affiliations get new cards to bolster their strategies. The two foil subsets continue to grow with 18 new "Archive" and two new "Archive Portrait" cards. A Physical Expansion released on 2006-09-01, containing 19 new 2E cards. Expand your collection as you explore the STAR TREK universe! Dangerous Missions Deluxe Draft Boxes, the newest product for this exciting card game. Three different fixed boxes are available, each containing exciting new gameplay and collectibility! 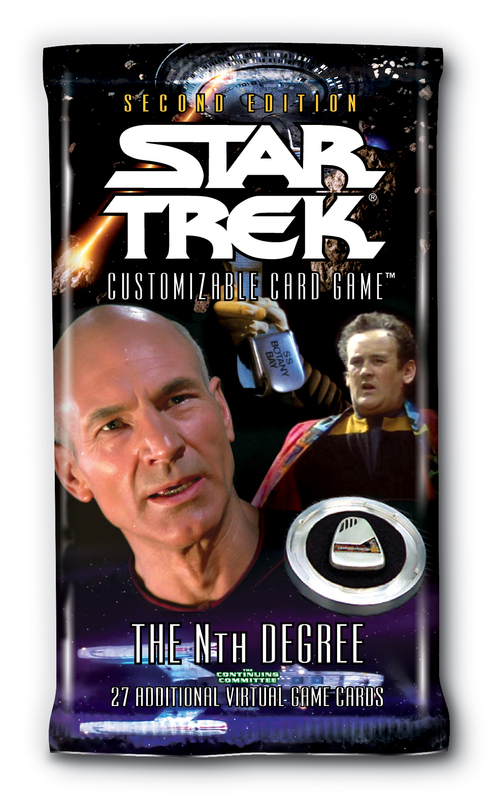 Nineteen new premium foil cards expand STAR TREK Customizable Card Game, featuring themed cards from fan-favorite episodes and movies! A Physical Expansion released on 2006-08-18, containing 120 new 2E cards. Get ready for the the crew of Enterprise! 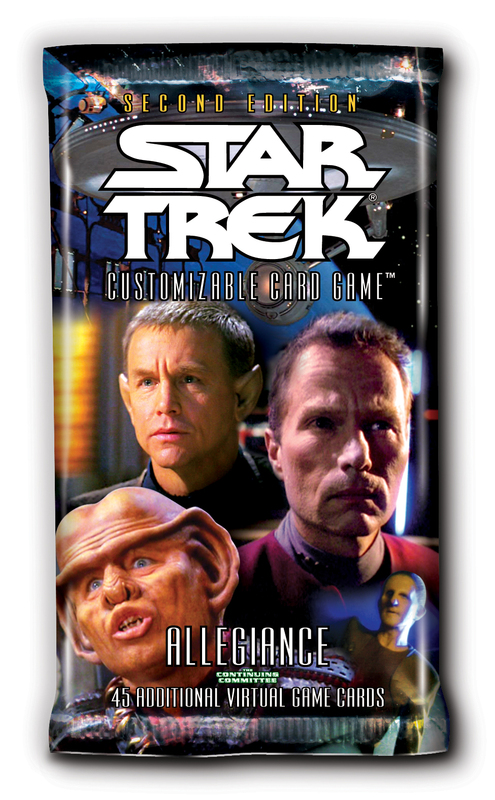 Characters like Captain Archer, Tripp, Reed and T'Pol launch a full-fledged affiliation and provide players with new game play options and strategies. The Enterprise affiliations feel will make all players look at their dilemma piles a bit differently. Affiliations specific dilemmas and the relicate keyword Boldly take this expansion in a bright new direction. The 122 card set includes an 18-card Archive foil subset and collectors can look for two Archive Portrait cards randomly inserted into packs. Are you ready To Boldly Go?? 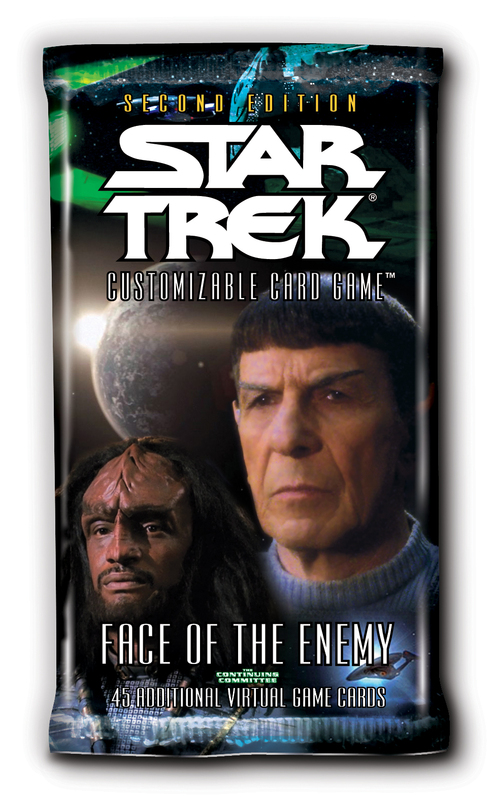 A Physical Expansion released on 2005-05-13, containing 120 new 2E cards. Be prepared to test your knowledge of the Rules of Acquisition in Strange New Worlds! Ferengi like Quark, Rom and Bok help their species become a full-fledged affiliation and provide players with new game play options and strategies. A sub-strategy utilizing androids makes its debut alongside hologram personnel such as Minuet and Sigmund Freud. The 120 card set includes an 18-card Archive foil subset and collectors can look for the first two of the Archive Portrait cards randomly inserted into packs. 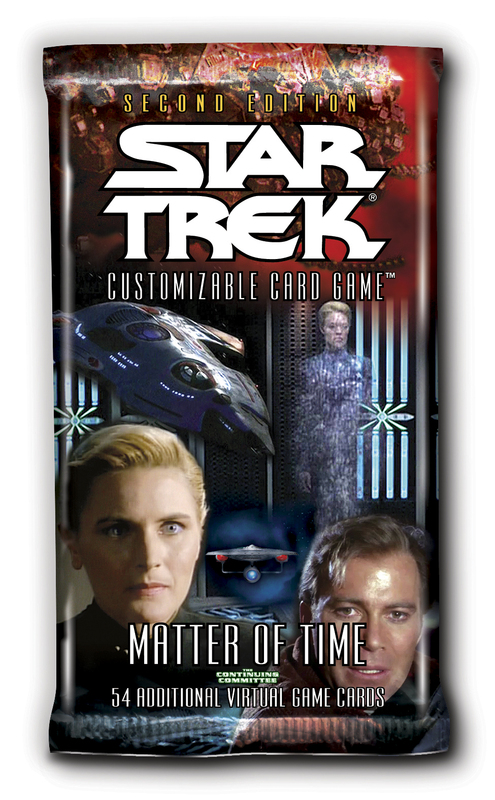 A Physical Expansion released on 2005-05-12, containing 18 new 2E cards. A Physical Expansion released on 2004-12-08, containing 61 new 2E cards. Reflections 2.0 includes 61 brand-new cards created in diffraction foil treatment plus foil versions of 60 rare cards from previous sets. Each 18-card booster pack contains two foils (generally one new card and one reprint), plus a mix of non-foil cards from Second Edition, Energize, Call to Arms, and Necessary Evil. This list includes the 61 new foils; the foil reprints are listed separately. A Physical Expansion released on 2004-10-13, containing 40 new 2E cards. Fractured Time ranges through the past, present, and future of the Star Trek universe, crossing the boundaries of parallel universes and timelines. From the Second Edition debut of James T. Kirk to the first Star Trek: Enterprise character - Daniels - to the return of the "Future Enterprise" version of the U.S.S. Enterprise-D, Fractured Time is packed with all your favorite space/time-bending episodes. A Physical Expansion released on 2004-05-03, containing 18 new 2E cards. Nine "ship and commander" pairs make up the exclusive Star Trek CCG Tenth Anniversary Collection of 18 diffraction foil cards. One pair will be available each week over a nine-week period with a $10 purchase at participating retail stores. Each card, in its upper right corner, has a Tenth Anniversary logo, which also appears on the cards in the Necessary Evil foil subset. A Physical Expansion released on 2004-03-17, containing 180 new 2E cards. The risks are big, but the rewards can be even bigger, once you embrace Necessary Evil! 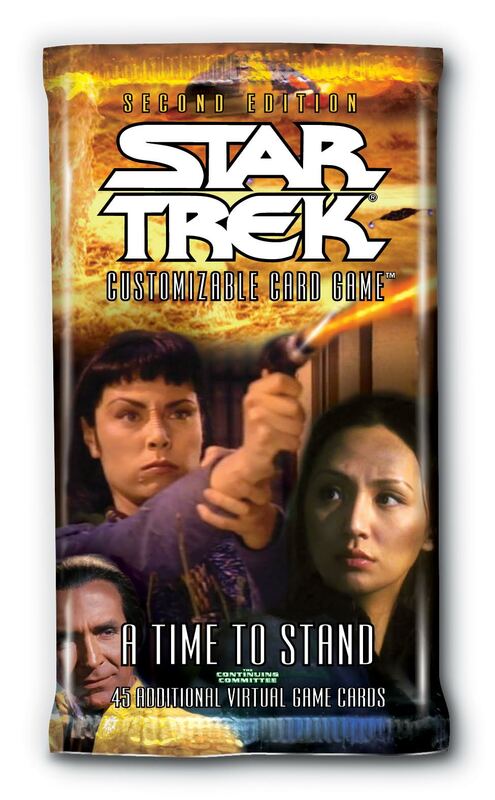 The newest expansion for the Star Trek CCG Second Edition adds new strategies for all affiliations, and brings to the forefront some of the darker moments of the Star Trek universe. The 180-card set includes an 18-card subset of rare cards that appear in both regular and diffraction foil versions. 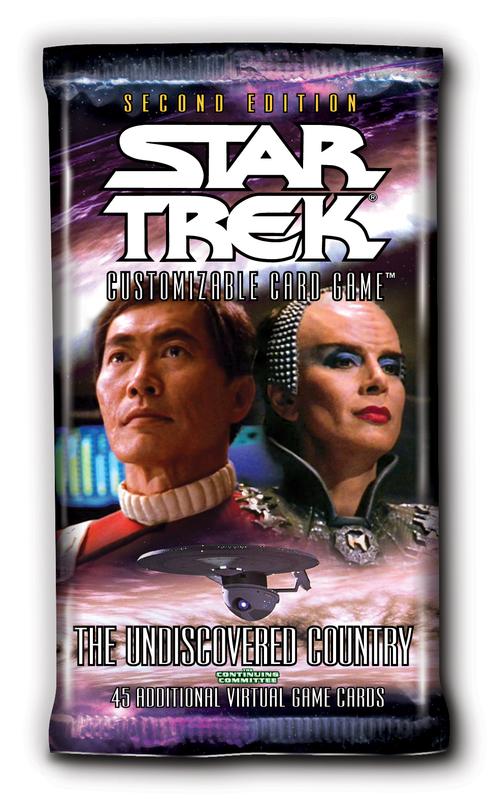 A Physical Expansion released on 2003-09-10, containing 208 new 2E cards. Raise the shields! The Gamma and Delta Quadrants are coming in full force to Star Trek CCG, with two of the most aggressive and dangerous affiliations in the Star Trek universe - the Borg and the Dominion. Alpha Quadrant beware: you're about to be assimilated and infiltrated! 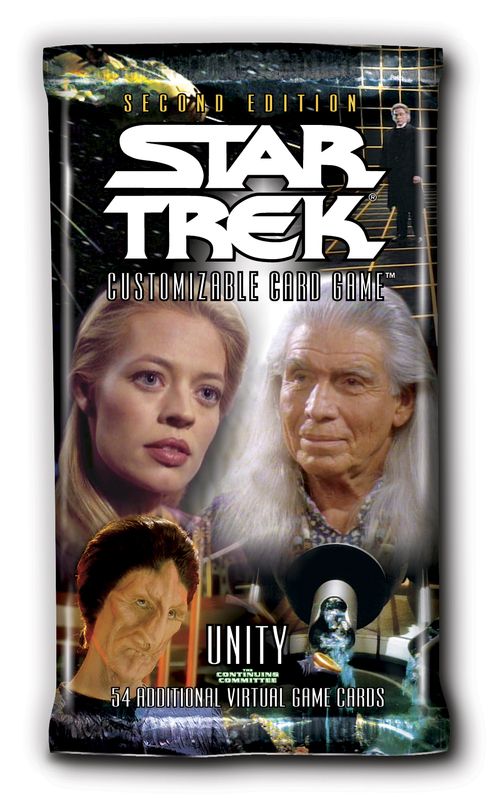 A Physical Expansion released on 2003-05-21, containing 180 new 2E cards. 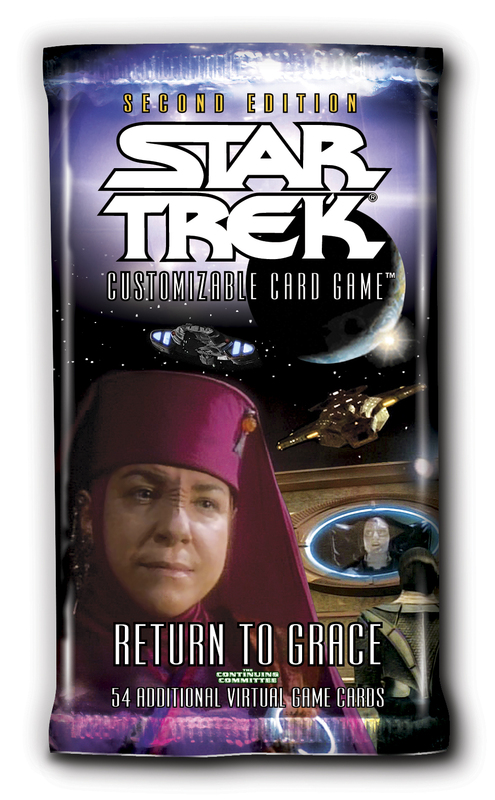 Energize, the first expansion to the Star Trek CCG Second Edition base set, is here! 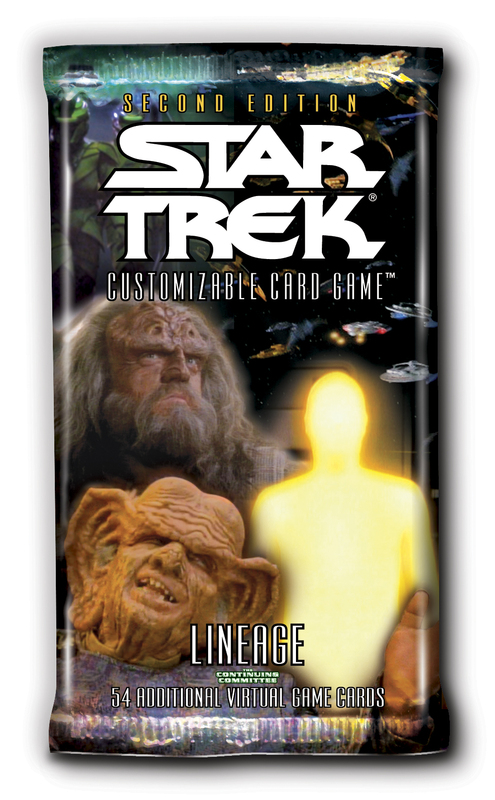 Augment your Second Edition decks with additional cards for each affiliation, new dilemmas, a new Maquis faction with their own headquarters, and new themes such as Kahless and his followers. A Physical Expansion released on 2002-12-18, containing 415 new 2E cards. Welcome to the new Second Edition core set! New cards and streamlined gameplay make a perfect entry point for both new players and former players eager to return. In addition, many Second Edition cards are compatible with First Edition gameplay - truly the best of both worlds! A Physical Expansion released on 2002-01-01, containing 64 new 2E cards. This list includes both regular and oversized cards, released for pre-release tournaments, retail, and other promotions. Diffraction foil versions of non-alternate image cards will be listed with the standard set.